Enjoy our spacious banquet facilities that are perfect for your wedding reception, anniversary, or other special occasion. 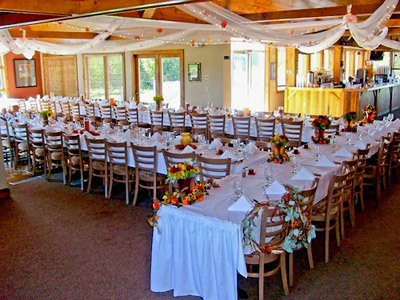 CreeksBend Golf Course’s banquet facility is perfect for hosting your special banquet events. From small get-togethers to large gatherings, CreeksBend is happy to accommodate your next business function or special event. Our facility can accommodate almost any size event and offers a deluxe, fully stocked bar along with a customized menu suited to fit your special day. Contact Rachel Evans today at (952) 758-7200 ext. 2 or email banquets@creeksbendgolfcourse.com to reserve your date, to check availability or to book your wedding or reception. Check out our 2019 Leagues! Click HERE for more information! CreeksBend Junior Clinics have been designed to give your child golf instructions and playing experience in a 6 session program. Click HERE for more information. Want to work at CreeksBend Golf Course? Now accepting applications for all positions for 2019. Click HERE! for applications and send completed ones to banquets@creeksbendgolfcourse.com! Sign up for a 2019 membership! Call the Pro Shop for details and rates! Subscribe to our email list for the latest promotions, updates and newsletters!Sign up here! Calendar of Special Events We thank you for your patronage and look forward to seeing you soon! !